I am a big fan of and use the Opportunity Assessment frequently in my own engagements. this is the perfect tool for you. 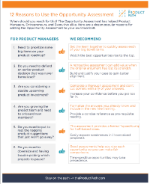 Use the Opportunity Assessment framework to quickly firm up your product decisions. Are you struggling with product decisions? Are you tinkering with a new idea but not sure it is worth exploring? Are you considering a sizable new product investment? Are you pitching your business to would-be investors and need to improve your odds? The Opportunity Assessment is a decision framework that helps Product Managers, entrepreneurs, and executives determine whether they have an idea worth chasing. You may come away feeling supremely confident about your product's chances of success. You are ready to begin validating your assumptions. You may head off weeks or even months of wasted time and save yourself lots of money. Start looking to discover the next great idea. You may quickly zero in on those parts of your idea that need more research. Circle back, you need to dig deeper on those specific topics. The Multi-Tool is easy to use. You're already wrestling with the idea itself - you don't need more grief. Experience has shown that this is the best way to capture, distill, and then present your ideas - all with a single tool! It may be another inconvenient truth but PowerPoint is still one of the most effective ways to summarize and share big ideas with others. When you choose the Opportunity Assessment for capturing and distilling your next big idea, why not do it right in a tool that also is designed for sharing? I understand that sometimes, you just need a quick and dirty option. Start with a simple blank template or download a bundle with more DIY assessment tools. My PowerPoint-based product is ideal for product teams. Easily capture your notes and then present your results - it's loaded with tips and includes a full example. In a workshop setting, I will work with your team to complete the Assessment for your opportunity and produce a final deliverable to share with your stakeholders. As part of this commitment to my customers and users, I am building a collection of Product Opportunity Assessments to share as examples. You may sample a few of them below or click to view our Assessment Library. Product ideas are not unique to Product Managers. Many of us are pursuing product-related ideas for our current company or to start new businesses. Read through our list of reasons for putting the Opportunity Assessment to work for you. Marty Cagan gets the credit for creating this streamlined approach and I encourage you to read more on this and related topics in his book Inspired - How to Create Products Customers Love.